Have you thought about getting your copy of The Hub via email each month? Fill in the online form to help the save the Club printing and postage costs. Robert Alexander Spiers 1937 Austin 7 Ruby Special. Commercial Report Graeme Shaskey hosted the March commercial noggin, a good turnout on a pleasant evening, thanks for emptying the garage to make room for the visitors and for the usual hospitality. The April commercial noggin will be on Wednesday 17th April at the Barn, mainly due to not having anywhere more interesting to go, see you there. Neil Shaskey. Proposed Changes to By-law “Code of Conduct” Carried Remit for discussion re “Alterations to the constitution” Discuss at committee and report back to Rod Brashaw,Tony Bartlett. Nth Isl are looking into running a two day rally during either May/June/July Mths along similar line to the Canterbury Irishman Rally. Will have different name. 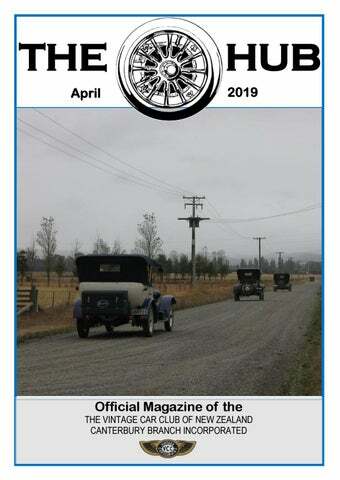 There is a very good chance a National Vintage Rally is a go ahead in maybe 2020 incorpating Taihape and Napier. Secretaryâ&#x20AC;&#x2122;s Report... A Web Site from FIVA that may be of interest to members on FIVA Guide for responsible use of historic vehicles on todays roads. http://www.fiva.org/wpcontent/uploads/ FIVA_guide_EN_single.pdf Comments about some garages having higher % of ethanol in fuel than others (they are allowed up to 5% without declaring it.) Check with your preferred Fuel supplier as ethanol is not good for some carburetors and fuel lines. Daffodil Rally; 2018 raised $62,000 from 28 Branches out of 36. 3000 cars entered. Contact Organisers with ideas for marketing in your local area. Like Local Businesses Sponsoring raffle prizes (Like Dinners , Nights Accommodation, etc) Local Free Papers for advertising. Stickers may not be produced this year. National and International Rallies: Only Vehicles up to B5 category are eligible for National and International Rallies. All C Category cars should be excluded from trophies but can attend. (Small number involved) New Pride of Ownership award : taken up by Ashburton Branch for Easter Rally . Maybe other Branches would like to take it up. McLachlan Trophy Awarded annually to the veteran vehicle, which covers the most mileage for the season. The mileage includes travelling to and from Calendar events and also includes the Mount Cook Rally. This trophy is for the combined competition between Canterbury, Ashburton, South Canterbury, West Coast and Banks Peninsula Branches. 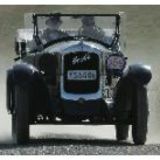 All Members who wish to compete for the above trophy should send a record of the rallies attended and their mileage covered to: Dave Inwood Canterbury Branch Club Captain 126 South Eyre Road, RD 2, Kaiapoi, 7692 (Telephone 03 327 4156) This is to arrive no later than 1 June 2019. March 2019 Noggin Display Our March Noggin Display was, 2 of the winners, from the 2018 Annual Vintage Rally. Both of these cars have been very active in the Canterbury Branch for many years and have travelled thousands of miles at various rallies. Congratulations & thank you to the following. Margaret & Paul Seaton 1922 Dodge Tourer, 1st Field Tests. Marilyn & Ian McKinlay 1928 Austin 16/6, 1st overall. Canterbury Branch Annual Rally & Canterbury Branch National Motor Cycle Rally Winners. P Group Annual Rally & any Canterbury Branch winners from the South Island Easter Rally. (Ashburton). 25,35, 50 and 60 YEAR BADGES (To be presented at the Branch Awards’ Dinner Sat 14 September 2019) If you are eligible for these badges, please contact Leigh Craythorne, telephone 342 9110 or email craythornes@actrix.co.nz for the appropriate form. Members must provide the proof of having completed 25 years continuous membership themselves (as there were only limited records held at National level before the early 1990’s.) E.g. You may have a copy of your nomination form or early membership list; the branch has bound copies of the “Hub” held in the library that may help you; ask the Branch Secretary’s permission to search the Branch Minutes; or I may be able to assist, as I have copies of some of the early membership lists. Please attend to this as soon as possible as the badges have to be applied for via National Office and forwarded to us from Wellington - delay may mean a wait until next year’s Awards’ Dinner for presentation. Please note: Members do not have to have been in the same branch for 25, 35, 50, 60 years – it is recognition for continuous membership of the Club. Past Events. Moped Run. 8 bikes turned up, Graeme Barnett was finally decided the winner of the trophy after an enjoyable meander through the outskirts of Christchurch 9th March - Clip-on Run. Alistair McKenzie organised this event which started from Halswell, And meandered through to Lincoln for lunch, with a return to the finish at Halswell again. The general consensus of opinion from the 16 riders was that it was a thoroughly enjoyable day out in good weather. Hopefully, Alistair has written a fuller report that is elsewhere in this Hub. 16-17 March – Jim Rooney Run. 9 riders enjoyed this overnight event that went to Fairlie and back, with a visit to The South Canterbury Truck + Steam Museum on the way down, and on Sunday morning pre the run home paid a visit to High Country Motorcycles just outside Fairlie. Again this event got the thumbs up from all concerned. There is a more comprehensive report elsewhere. 30 March – Fish & Chip Run. Unfortunately on same day as the branch Annual Rally. In the future at time of writing; with luck the AJS and Norton Owners will join us for the ride too. Future Events. 10 April – Monthly Noggin. Being held at Casting Shop Ltd, 5a Watts Rd, Sockburn, 7.30pm start. BYO. 27 April – Scooter and under 250cc Motorcycle Run. See elsewhere for full details. Organiser is John Benn; he has whole event fully organised BUT... he must shift house that weekend. Can someone run the event? Please contact John at torg@xtra.co.nz or contact Phil Jeeves at philipjeeves21@gmail.com 8 May – Monthly Noggin. Being held at Dutton's Garage, 148 Carlyle Street, Sydenham. 7.30pm start, then adjourn to local watering hole afterwards. 25 May – Fish & Chip Run. As usual, PMH Hospital, 10.15 am for 10.30 am departure. Possibly a run to Ashburton to view a shed worthy of inspection. This was the run planned prior to Christmas but was cancelled due to heavy rain. 26 May – Rough Run, at McLeans Island. More details next month. That is about it for this month, enjoy the motorcycle before the really scrappy cold weather settles in... Cheers, CML. 2019/20 Canterbury Branch Committee Nominations This is your chance to assist us with helping to run the Branch, from organising rallies, maintaining the grounds and buildings, organising social events, in fact most things the Club does at the local level. The committee meets once a month on the first Monday of every month. All positions are open for nomination: Chairperson, Secretary, Treasurer, Group Convenors, Social Convenor etc. All you need to do is fill out the form below, and give it in person to Rod Thrower, the Club Secretary, post it or scan and email it to the addresses below . on the Canterbury Branch Committee. Hi to you all Les Sloan took care of this outing and a great day we had. Perfect weather, a lovely ride through the countryside and we went to places we don't visit too often, Rakaia Huts, Taumutu, Timberyards Road and we stopped at Leeston Domain for lunch. After lunch we visited McLachlan's collection of Cadillacs, and assorted vintage cars, motor bikes, farm machinery and ex army trucks. A great day was had by all. A good raffle and 50 cars. Les Sloan donated the $100 entry fees to The Friends of Ellesmere Hospital. April 10 Ray and Linda Maginnes Meet at Dunsandel Community Centre at 9.55am May 8 Dave and Pam Dacombe Meet at Princess Margaret Hospital at 9.55am June 12 Kevin and Jane Jury July 10 Mid Winter Christmas Lunch at The Barn. Pot Luck and remember the Maori custom. (Bring for 2 and eat for 1. Colin Clutterbuck is organising a hobby display for all those who have hobbies and like to share them with us. Looking forward to seeing you all next month. J K and The Team. Committee Members Needed - Swap Meet Roles The Swap Meet committee has 2 vacancies which urgently need filling before our first meeting for Swap Meet 2019. The first is a Sites Coordinator to take over from Kevin Clarkson, who has enjoyed the role for the last few years. Reasonable computer skills are required to maintain the site register and spreadsheet and manage the bookings and payments. Most of the work occurs during Swap Meet, but enquiries do continue during the year from time to time. The pay is rubbish, but the satisfaction of a successful Swap Meet and working alongside a dedicated group of new friends is a reward that will more than compensate for your time and effort. We also need a Workforce Coordinator who can take over from Ian McKinlay, who has championed this role for more years than he can remember. Ian would like to phase a new person into this role so he can step aside this coming year. Again, most of the work is immediately before and after Swap Meet, and is all about ensuring the grounds and basic infrastructure is set up on time and ready to roll come Swap Meet weekend, and then everything is packed up again and put away afterwards. Contact Ian for further information on 03 349 6951 or Colin Hey on 03 359 8737. If you're interested in either role please give Colin Hey a call on 03-359-8737 or 021-883-807. Moped Run Sunday 3rd March 2019 A total of eight keen riders arrived on a glorious Sunday morning and following the welcome took off from Princess Margaret Hospital, past Halswell Quarry, for a photo stop at the Tai Tapu Memorial Gates. he bikes and drivers were (f.l.t.r.) Matt Opie (Vespa), Arthur Poll, Thomas Brown, Gary Arps (all Honda), Kurt Ebrecht, Gary Hodder (both Puch), John Benn (Benelli) and Graham Barnett (Victoria). The riders then drove the loop down Rhodes Road, with sloping curves and a bit of gravel. After crossing SH75, more bends and gravel were waiting along River Road, and then the race was on to Motukarara for morning tea at Waihora Park where Sharon was already waiting with freshly baked muffins and cinnamon scones. John Benn provided the entertainment with his ongoing efforts to get his 1970 Benelli Gentlemen started at each stop. With all the extra weight, the mopeds had their work cut out to climb Gebbies Pass. Graham’s 1959 Victoria wasn’t quite up to the task and wanted to be pushed. Sharon had to come to the rescue with the backup trailer to bring the Vicky over the hill and down to the Wheatsheaf. The Vicky was offloaded and Graham persisted, but later both needed to be retired to the trailer. The road from the Wheatsheaf to Lyttelton has been done hundreds of times, but on this Sunday, what a glorious sight with the sun out and the tide in. After an uneventful cruise through the tunnel, the participants reassembled at the Valley Inn for much needed refreshments, lunch and prize giving. The publican even put on a $50 bar tab! The Owen Dawson Memorial Trophy “for the rider who tries hardest” had to go to Graham Bennet, although John Benn came in a close second. The Publican’s Choice Award went to Garry Hodder on his 1957 Puch VS50L. Those who completed the round trip back to Cashmere had travelled 80 km. Special thanks again to Sharon for being back the up driver so the rest of us could enjoy a day out with security that we would get home one way or another. Kurt Ebrecht. 12th of February was the monthly outing for the VOG enthusiast’s, meeting at Pete Gatehouse’s vineyard they eventually donned safety gear and mounted their steeds. I would think that the Knights of the roundtable would have taken less time suiting up catching a horse and mounting it and taken off to save a damsel in distress! But the temperature and the fact that they all carried gold cards may be used as an excuse for the time taken. Eventually they formed a line and left for the first stage of the trip and the lunch stop. Lots of dust, shingle flying and battle cries saw the group head off to follow their instructions. When they arrived at the lunch stop, fortunately there were only 4 directions that they could approach the Hotel as they used all roads to get to their destination. Over lunch it could be heard some members of the group deciding which way was left and right so this explained the divergence of riders when approaching the lunch stop. Clip On Run The weather for the Clipon Run was very kind but not the days before and after. 17 riders left from Halswell for the 26km round road trip venturing to Lincoln via a new subdivision. On arrival at the 'Mens Shed' car park at Lincoln riders were asked some questions by the marshals on the subject of Clipons sourced from the book â&#x20AC;&#x153;The Stinkwheel Sagaâ&#x20AC;?. A short ride to the lunch stop then a quiet ride back to Halswell finished the day. The Clipon and Nut Strangler trophies were presented along with a couple of automotive products which were donated. REAR WHEEL BRAKE RALLY 2019 REPORT On awakening on Sunday the 10th March we drew back the drapes and with a sigh of relief we muttered “At least it isn’t raining”. Drivers of two wheel brake vehicles know only too well that wet weather and two rear brakes are not an ideal combination. As we motored to the rally start in Kaiapoi, the weather started to deteriorate, and there was surface water lying on the road. We had a couple of incidents approaching changing traffic signals to remind us of the challenges of driving these old cars in the wet. On arrival at the Kaiapoi New World car park we joined the other twenty plus cars including members from three other branches, Timaru, Ashburton and Wellington which was very pleasing for the organisers. The welcoming morning tea was provided by the Sword Family. The delicious lemon muffins were well received. The Rally was to take us north to Rangiora, over the Ashley River, down the back roads to Sefton, Balcairn, and Broomfield, connecting the Main Highway and on to our lunchtime destination at the Glenmark Railway Station. By now the weather was showing signs of clearing and our thoughts went out to the farming communities as we had travelled through the parched country side, so the rain would have been welcomed by the areas farmers. After lunch Graeme’s grandson Matthew spoke about his volunteer work and history associated with the Weka Pass Railway. This was followed by a conducted tour around the railway workshop for those who wanted with the rest choosing to stay at the station. The afternoon run went through Amberley country side ending up at “Mt Grey Olives”, a property owned by John and Jan Field-Dodgson. John spoke to the group about the history and the products produced from their Olive Trees and Lavender Plants, Olive Oil production was John’s responsibility while Jan produced handmade soaps and skincare products. Afternoon tea was provided by the Sword family while we were invited to look around the olive groves or try samples or purchase products made at the farm from the sales table. After leaving “Mt Grey Olives” we travelled on back roads back to “Pineacres Restaurant” where 49 of our members enjoyed the early delicious two course dinners. Many thanks to Graeme Sword and his family and the helpers for providing us a most enjoyable and memorable Rally. June & Don McClelland. P/S from the organisers, Many thanks to the entrants, marshals, backups, Weka Pass Railway, Mt Grey Olives & Pineacres Restauant, with a special thanks to our guests from other VCC branches namely, Alister Day (Timaru), Paul Finch Ashburton & Norman Willis (Wellington) and their Families for helping to make this rally a success. Graeme Sword & Family. Jim Toohey Memorial Rally FROM THE BACKUP DRIVERS SEAT The weekend of 16th & 17 March was the date for this years’ annual motorcycle sections Jim Toohey Memorial Rally. This year Fairlie was our destination and a smaller than normal team arrived at the start in Rolleston on the forecourt of the new NPD petrol station out there ( or as some call it the “New York Police Department”). The route set by Mike Glenday saw us head out of Rolleston and out through Kirwee and Darfield via some minor roads, although Mike who was absent this weekend doing the Scenic Land Rally caused some confusion to the riders. Soon after leaving Rolleston there was an instruction that read “right into Railway Rd” but alas it was a “No Exit” Road. Turns out the instruction should have read “right into Wards Road “ tsk tsk that was okay no one got lost. Passing Darfield we turned off on Bangor Rd to head through to the Rakaia Gorge and over the gorge bridge “Top of the gorge and left into Waimarama Rd” read the next instruction quite plain to Jan and I but oh no the riders took the first left after the bridge not Waimarama Rd. This may sound fine to all who read this but in practice this was not the case. An SOS phonecall was received by the backup vehicle to say Joseph McClintock had a malfunction with the points system on his amazing Henderson motorbike and was about 5k from the “turnoff” how far away were we “not far” I commented. Okay Joseph and Quentin will head off back to ChCh on Quentin’s bike and pick up Joseph’s Suzuki and head back and meet us at the lunch stop so he can continue the ride. Very dedicated riders are these guys. Blandy, Graham Barnett and Paul Ainsworth will wait with the bike until we turn up. Guess what we never found the waiting party or the bike. Got all the way to Methven without siting them!! Some of the team were still in Methven supping on coffee “all okay” they ask No! says I we can’t find the broken down lot. Oh they’re straight back up that road pointing to where we had just come from - strange we thought. That’s when we realised the error of the riders ways they had misunderstood the instruction and were stranded on the bit of road from the gorge and where Waimarama Rd comes out onto the Methven road. So off back down the road we go in hot pursuit and hey presto there they were – whew!! Henderson was loaded safely on the trailer and back to Methven we go for a well earned coffee. Morning break complete and off we go again heading to our lunch destination in Temuka via Mayfield, Lismore Mayfeld Rd, Moronan Ealing Rd and through to SH1 near Orari and then on to Temuka for the lunch stop. By this time the sun was shining and it was actually very warm considering rain had been expected for the weekend but that never came to anything. Jim Toohey Memorial Rally... True to their word Joseph and Quentin arrived back just as the last morsels of our sausie rolls and sammies were consumed unfortunately there was no time for them to graze so it was back on the bikes and off we went towards Falvey Rd and turn off opposite the old Seadown garage to view the South Canterbury Steam and Truck Museum. Very impressive. I would call it a junior version of the Bill Richardson Transport World in Invercargill with lots of old trucks out of the 50’s and 60’s on display I think all the surviving Thames Trader trucks from around NZ must be there, crikey there were heaps. Obviously a popular transport operators choice of commercial vehicle in their day. By this stage the time was creeping on so it was “Fairlie here we come” and after passing through Cave and Albury we managed to make it before dark to our destination and our nights accommodation at The Top Pub Fairlie. Sunday most of us headed back via Geraldine – Mayfield and Thompsons Track and out onto SH1 at Rakaia although 3 riders decided to take the “Scenic Route” back via Rakaia Gorge. As backup vehicle we assume they made it safely home, there were no reports of missing motorcyclists on the wireless. Winner of the Jim Toohey trophy this year was Kurt Ebrect on his 1952 Puch 250cc. Kurt had a lot of small niggly problems with the bike during the Saturday run but due to his tenacity and stick at it ability he managed to repair these problems on the side of the road and make it to the overnight stop without putting his bike on the trailer. That Man Certainly deserved the prize. Royce & Jan from the Backup vehicle. If you have an article you would like published, a funny story or some photos of a recent event or rally you could share, please send them through to the Editor for inclusion in a future edition of The Hub. Upcoming Events Two Day Autumn Overnight Run Sat 6th and Sun 7th April 2019 Open to all VCC Members Starting in (KAIAPOI NEW WORLD CARPARK). Be there by 9.00am for a 9,30 Start. Morning tea supplied at the start. Information for participants: Please bring along some cash for a raffle, also for the lunch on Sunday which will cost $15 per person profits going to two charitable organisations in Waiau. Saturday lunch will be a bring your own lunch at Kaikoura. Notice of Veteran Noggin Thursday 16th May 2019 The first of what might be regular noggins for veteran car and motorcycle owners. To be held at the home of Colin & Jenny Hey, 34 Rossington Drive, West Melton. Tea, coffee, soft drinks and supper provided - please BYO alcoholic drinks (in moderation please). Start time is 7.30pm. 65th Irishman Creek Rally 2019 1-3 June 2019 This yearâ&#x20AC;&#x2122;s rally will start opposite the Gladstone Hotel in the main street of Fairlie. Please remember this is a state highway and can be very busy. Park back from the road in a considered manor to allow enough space for the 150 plus vehicles that normally attend. Can we please gather at 8.00am for a quick briefing before departing at 8.30am. Rally sheets can be collect from the Gladstone Hotel in Fairlie on Friday 31st May from 6pm -9pm. If it is possible it would be far easier if everyone can collect their packs on this night. Sundays run will start from outside the Gladstone Hotel again. Can we please gather at 8.30am before the start. Prize giving and supper will be in the community hall which will open from 6.30 for a 7.30 presentation. While back up vehicles are provided all vehicles must be self sufficient and carry chains for mud or snow and be adequately prepared to cover some distance on back country roads with river crossings. The Irishman Rally is open to Vintage Car Club Members only and for Vintage and Veteran aged vehicles. The winner and runner up will be drawn as per tradition from the entrants participating. All entrants are eligible without exception. The winner and runner up will be joined by a small team to assist with the task of organising the following yearâ&#x20AC;&#x2122;s event. This is what makes the rally special and provides the variety we see each year as a new person gets to put their mark on this event. While this is a challenge there is a team behind you. george.kear@charton.co.nz George Kear, 40 Rossendale Road, RD 5 CHCH 7677 Payment by direct credit, with your name and “Irishman Rally” to: VCC Canterbury Branch,03-1594-0096832-00 Or by cheque, payable to VCC Canterbury Branch. WANTED Hello. Anyone help with this request please. Will writes. I am a new member [North Otago Branch]. I have Italian Vintage cars. Both an Ansoldo and a Diatto [both of 1923 vintage] and [naturally] would like to meet the owner of a Vintage Ceirano which I understand is in N.Z. and [hopefully] a member of the club. May I request your help with his contact details please. Best, Will. If you have an advert you would like to repeat, please let The Editor know. Otherwise all adverts will run for the month of publication when received. Interesting extraâ&#x20AC;Ś How many people currently own one of these cars? Which Brand? Answers for last month (M vehicles) How many could you guess? OTHER BRANCH and ORGANISATIONS EVENTS See Notice board posters for more information. Copy for the May Hub closes on 24 April 2019 Contact "The Editor", Brendon Eason By phone 027 346 8324 or preferably email vccthehub@gmail.com The views expressed in â&#x20AC;&#x2DC;The Hub' are those of the contributors and are not necessarily those of the Committee, Editor, Branch or Club.